How many of us grew up with this album? If you saw the pictures of my parents last week, I’m sure the fact that I owned this album is not coming as a shock. Growing up as a child of the 80s, I didn’t actually know anything about disco, or how to dance (actually I’m still grappling with figuring out this “dance” thing), but I knew this music made me want to move. I also knew that I had to get myself a flashy outfit, like the one Mickey was stylin’. Everyone’s favorite, Macho Duck, which sounds suspiciously like an imitation Village People, is a perfect slice of Donald and his personality. Throughout the song he is boastful, prone to accepting flattery, and gets flustered when his flaws are called out. 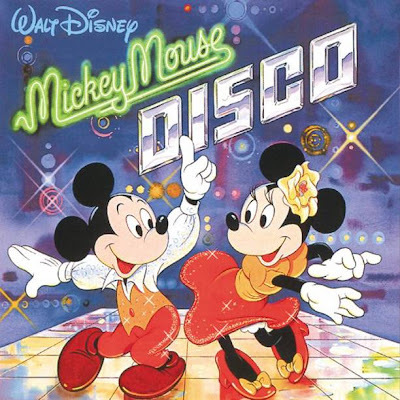 Songs like Disco Mickey Mouse, The Greatest Band, and Mousetrap all begged for choreographing, and I am willing to go out on a limb and bet my sister and I had set dance steps for some of these songs. Thankfully, after much searching, I could find no photographic evidence of these heinous incidents. While most people who can remember Mickey Mouse Disco cling to Macho Duck, my fondest memories come from Watch Out for Goofy! Goofy was my favorite of the gang as a child, so that explains part of my fondness for the song. Otherwise, I can only say that, even at a very young age, I knew I was going to be a gangly white boy with two left feet. Peeling back the layers of this album, renditions of Disney movie hits, Zip-A-Dee-Doo-Dah (Song of the South), Welcome to Rio (Saludos Amigos), and Chim Chim Cher-ee (Mary Poppins), create a sense of fractured recognition for the album. I remember trying to sing along to Zip-A-Dee-Doo-Dah and failing miserably because the timing had changed, and I couldn’t quite get the new flow. I would cautiously compare these selections to Superman’s Bizarro World, they seem so familiar but you know that something isn’t right. Oh, and if you think it’s a small world is annoying in its regular form, try listening to the disco version presented here and not wish you were deaf. I hadn’t listened to this album in years, but continually checked that it was well protected with my parents, until I stumbled upon it on iTunes earlier this year. Sure enough the catchy lyrics and upbeat rhythms got to me and I was up trying to convince my wife (then fiancée) to help me put together moves for The Greatest Band. For the record, she sighed, walked out of the room, and attempted to ignore me while I boomed out Macho Duck and worked at my Goofy impression, all while shaking my money maker. I found out that I was, indeed, just as bad a dancer as Goofy. It’s great to take a look back at your childhood, just so long as you don’t stare, it’s rude. Yes, Ryan, we ALL remember that album...especially "Macho Duck". And I do believe you are correct in hearing some close correlation between it and a Village People tune. No matter what, keep dancin' pal! Thanks for encouragement! My two left feet appreciate it, and will keep on movin'! i would (not literally) kill to find this on cd! I loved "Mousetrap!" and "Watch Out For Goofy"! I LOVED this album! I think I was 8 or 9 when it came out and I can remember getting it for Christmas. Oh I wish I could find this on CD and let my 3 year old son enjoy it!! I'm just thankful I was able to find it on iTunes! I don't care who you are, or what generation you come from, if you are a child, or have a child in close proximity to you, you can't help but shake your groove thing to this album! I know my preschool class loves it! I grew up with this album and it stuck with me forever! I still play this classic album even to this day. Now, I have this on vinyl, CD, cassette and yes, those little things called 8-track tapes. This album still grooves! Haven't I been here before? Everybody neat and pretty? Then on with the show!